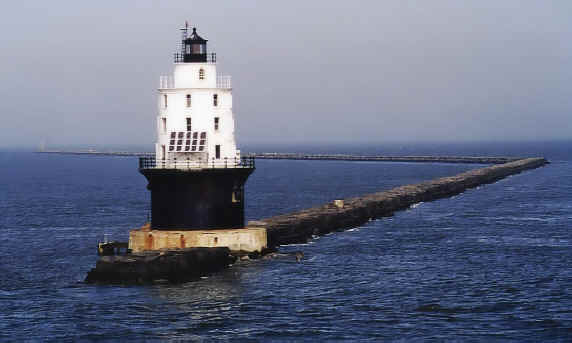 · Description: A white, hexagonal, three-story, frame structure, with lead colored trim and a black lantern atop a brown, cylindrical, iron foundation. · Fate / Disposition: A series of storms from 1918 through the early 1920s eventually rendered the lighthouse inhabitable and it was subsequently dismantled by the United States Lighthouse Service in 1925. · Description: A white, conical, metal tower topped by a black lantern. The superstructure rests on a black, trumpet shaped, iron caisson built into the breakwater. The pier is lined inside with reinforced concrete and the tower with brick. The whole structure is supported upon a heavy block of concrete lying within the breakwater. · Original Optic: Fourth Order (four-panel) Fresnel Lens (IOV) with a single flash every 10 seconds. The lens revolved on ball bearings and was driven by a clockwork mechanism activated by weights within a hollow central iron column.